The University of Birmingham is offering scholarships for international students for the undergraduate LLB program. The applicants for University of Birmingham International Scholarships in Law, 2017 should be international students classed as overseas fees status. The candidates should have applied for one of the LLB programmes: LLB for Graduates, LLB International Law and Globalisation, LLB with Business, LLB with Criminology, LLB with French Law, LLB with German Law. The applicants should have selected Birmingham as their firm choice. 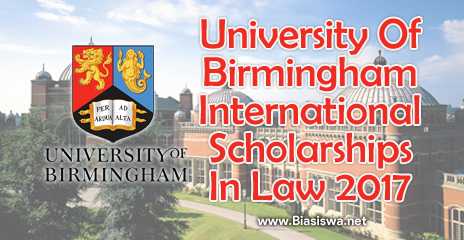 The candidates applying for University of Birmingham International Scholarships in Law, 2017 should complete the LLB scholarship application form. The applicants should also submit a statement of 500 words explainin why they should be given the award. The candidates should include UCAS ID number in their letter of motivation. The applicants for University of Birmingham International Scholarships in Law, 2017 are assessed absed on their academic merit. The recipients get £3,000 per annum in the form of the fee reduction.